“Textile pest Insects” is a general term given to any insect that has the ability to digest a natural protein called keratin that is found in wool, fur, animal hair and feathers. 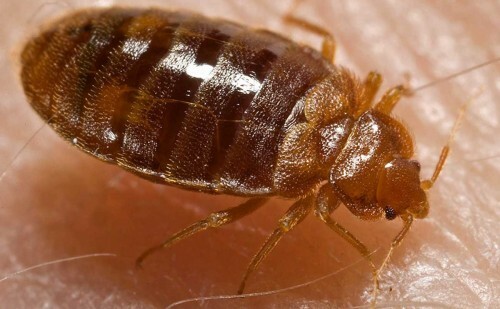 The warning signs of a textile pest infestation include live or dead insects on or around natural textile products and damage to the infested items. Textile pests often originate from birds nests. If not recognised and treated textile pests can do catastrophic damage to carpets, clothing, soft furnishings and even historic artifacts. 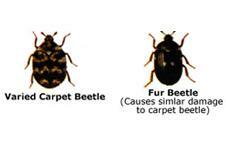 A common source of problems in some homes is the carpet and fur beetle. These small insects similar in size to the ladybird thrives on proteins in natural fibres, like wool, causing damage to both carpets and clothing. Adults are 2 – 4 mm long and variable black or brown with mottled yellow or white markings. A pest primarily in the home, food and museum sectors (the latter causing a significant threat to collections). Mating occurs immediately after emergence. The female produces up to 100 eggs over a period of two weeks. Larval development lasts for 10-30 days. Larval forms (known as the “Woolly Bear”) can reach 4 – 5 mm in size before pupation and can cause considerable damage to products such as wool, fur, leather, silk and animal skins, and occasionally cereal based food products. Adult Carpet Beetles usually live outdoors on pollen and nectar, and thrive in situations where they remains undisturbed, such as under carpets, bird and rodent nests and animal remains. Before treatment can begin, the first step is to trace the source of infestation such as old birds’ nests in lofts or rodent nests under floorboards. The Fur Beetle may be found in a wide variety of products including furs, skins, textiles and grain. Adult Carpet Beetles live outdoors on pollen and nectar; they can also be found wandering on walls and windows. In temperate climates the larvae are particularly evident in autumn when they wander in search of food and hibernation sites. Carpet Beetles thrive in situations where they remain undisturbed, for example beneath carpets, around skirting boards and in wardrobes. Bird and rodent nests, animal remains and dead insects are frequently reservoirs of infestations, so museums are a favourite stop. 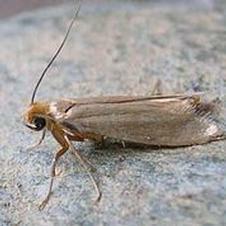 Clothes Moths rarely fly to lights at night and instead prefer darkness, such as a closet or storage chest. Any Clothes Moths fluttering around the house are probably males, because females travel by running, hopping, or trying to hide in the folds of clothing. The female lays 100 – 150 white eggs on the surface of the fabric which will hatch into larvae in approximately 5 days. 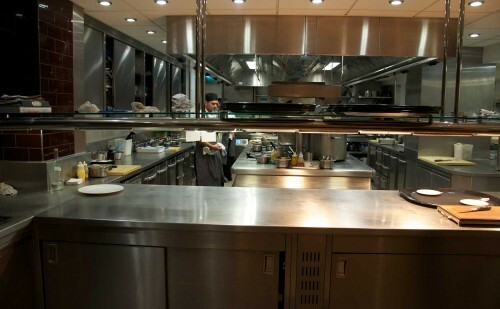 The period of larval development is usually 6 weeks, during which time the larvae actively feed on the fabric, however, this can take considerably longer under cooler conditions. This widely distributed insect feeds on a great variety of plant material, such as dry seeds, seed potatoes, rubbish in bird nests, thatch on roofs, fungi on trees, and miscellaneous dry vegetable refuse. It is known to do serious damage in wine cellars by boring into corks, and is also said to infest homes, feeding on dry seeds, meal, and carpets. The White-Shoulder House Moth is found wherever broken grain, flour, or other vegetable debris is allowed to accumulate undisturbed. The male and female average 6.3 and 10.5 mm long, respectively. Recently emerged adults can be readily recognised by their white shoulders and prothorax, contrasting with the grayish-white forewings that are marked by dark patches. Hiring a reputable pest control company like EnviroGuard to deal with a textile pest infestation in a responsible and professional manner will help to achieve quick effective control. All Pesticides used in the control/treatment of insect pests are selective and applied to ensure public safety. Our Pest Control Technicians will also be pleased to give advice on the safety of animals where pesticides have been used. For further details about textile pest insects or to book a survey please enquire online or give us a call.